Just beyond the backdoor of the home belonging to radiation oncologist Dr. Shiao Y. Woo and philanthropist John Shaw-Woo lies an urban oasis where they can revive, relax and restore balance to their busy lives. Behind a towering Victorian on a bustling city street, there’s a secret sanctuary. 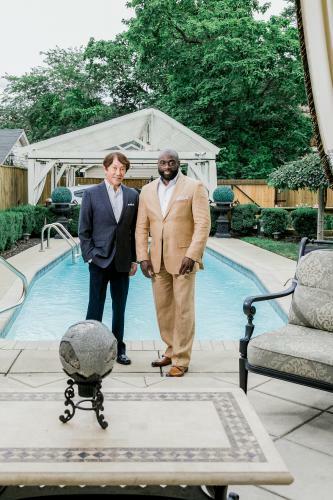 A sparkling pool, elegantly appointed outdoor living room and lush landscaping provide a spa-like retreat for Dr. Shiao Woo, chairman of the Department of Radiation Oncology at the University of Louisville School of Medicine and John Shaw-Woo, founder of GFoundation Inc. This carefully-designed extension of their indoor living space is part of their commitment to overall wellness and well-being.